Try one of these 10 minute ab workouts and your abdominals will be burning! If you're ready to get a good abdominal workout in 10 minutes get your stop watch ready. It's easy to construct a 10 minute core workout, but finishing it is the tough part. Here's a simple way to blast your abdominals in 10 minutes. Pick 7 of your favorite ab exercises and do them each for 1 minute with 30 seconds resting in between. You workout will look like this. Ab exercise #7 - 9:00-10:00, Done! No matter which ab exercises you choose this 10 minute workout will be tough, so listen to your body and try to build up slowly. If you are a beginner, you can make this 10 minute abdominal workout easier by reversing the work to rest ratio. Instead of doing the ab exercise for 1 minute and resting for 30 seconds, do the exercise for 30 seconds and rest for 1 minute. Once you master the beginner workout you can slowly progress towards the advanced workout listed first, but changing the work to rest ratio again. Do the exercise for 45 seconds and then rest for 45 seconds. This is just sample way to construct your ab workouts. 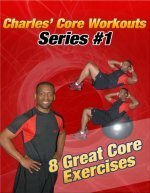 Pick your favorite ab exercises from the picture directory of ab exercises and do your best to finish the workout in 10 minutes. Remember to have fun when you workout.